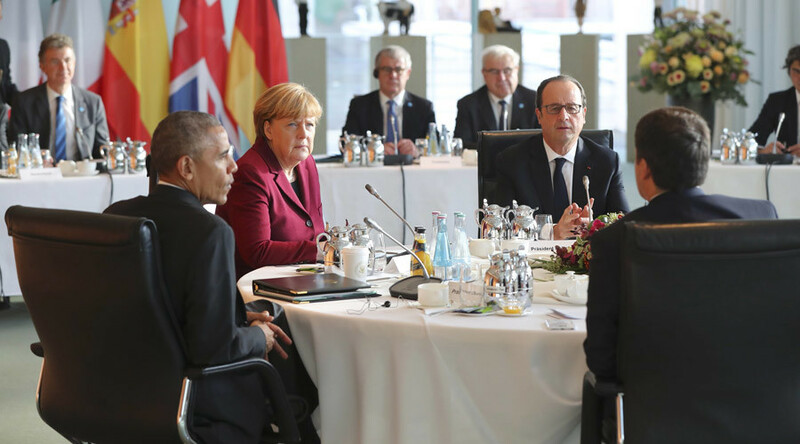 In a conference chaired by Germany’s Chancellor Angela Merkel, as predicted earlier, U.S. President Obama and European Leaders decided to continue their respective sanctions regimes against Russia. In a show of solidarity, the U.S. and the EU decided to stiffen their stance against Russia regarding the ongoing crisis in Eastern Ukraine. The conference also discussed and emphasized the importance of the NATO Alliance. Leaders on both sides of the Atlantic unanimously agreed on the continued need for Russia to fully meet its commitments under the Minsk agreements, which are an essential condition to uplift Ukraine-related sanctions against Russia. imposed regarding Syria. In this context, the leaders did not follow the pleas of the Syrian opposition to impose further sanctions on the Assad Regime. The EU’s High Representative for Foreign Affairs and Security Policy Commissioner Federica Mogherini did however meet with the Syrian opposition to discuss the possible political and institutional future of Syria. This show of solidarity comes at a time when President-Elect Trump has hinted that he might relax sanctions against Russia given that he wishes to explore possibilities how the U.S. and Russia can co-operate in their fight against ISIS in Syria. President Obama and the participating EU leaders stressed the need for a political solution to the civil war in Syria, which should include the removal of the Assad Regime from power. However, President-Elect Trump has stressed that the fight against ISIS should be the overriding priority to solve the crisis in Syria. Be the first to comment on "EU and U.S. Decide to continue Russia Sanctions"